Hemolysis is the breakdown of red blood cells. Red blood cells normally live for about 120 days. After that, they die and break down. Red blood cells carry oxygen to all of the body. If red blood cells are breaking down abnormally, there will be fewer of them to carry oxygen. Some diseases and conditions cause red blood cells to break down too soon, causing fatigue and other more serious symptoms. Inherited Hemolytic Anemias. You may have problems with the hemoglobin, cell membrane, or enzymes that maintain your healthy red blood cells. This is usually due to a faulty gene(s) that control red blood cell production. While moving through the bloodstream, abnormal cells may be fragile and break down. Sickle Cell Anemia. A serious inherited disease where the body makes abnormal hemoglobin. This causes the red blood cells to have a crescent (or sickle) shape. Sickle cells usually die after only about 10 to 20 days as the bone marrow can't make new red blood cells fast enough to replace the dying ones. In the U.S., sickle cell anemia mainly affects African Americans. Thalassemias. These are inherited blood disorders where the body can't make enough of certain types of hemoglobin, which causes the body to make less healthy red blood cells than normal. Hereditary Spherocytosis. When the outer covering of red blood cells (the surface membrane) is defected, red blood cells have an abnormally short lifespan and a sphere, or ball-like, shape. Hereditary Elliptocytosis (Ovalocytosis). Also involving a problem with the cell membrane, red blood cells are abnormally oval in shape, are not as flexible as normal red blood cells, and have a shorter lifespan than healthy cells. Glucose-6-Phosphate Dehydrogenase (G6PD) Deficiency. When your red blood cells are missing an important enzyme called G6PD, then you have a G6PD deficiency. The lack of enzyme causes your red blood cells to rupture and die when they come into contact with certain substances in the bloodstream. For those who are G6PD deficient, infections, severe stress, certain foods or drugs, can cause the destruction of red blood cells. Some examples of such triggers include antimalarial drugs, aspirin, nonsteroidal anti-inflammatory drugs (NSAIDs), sulfa drugs, naphthalene (a chemical in some mothballs) or fava beans. Pyruvate Kinase Deficiency. When the body is missing an enzyme called pyruvate kinase, red blood cells tend to break down easily. Acquired Hemolytic Anemias. When your hemolytic anemia is acquired, your red blood cells may be normal but some disease or other factor causes your body to destroy the red blood cells in the spleen or bloodstream. Autoimmune hemolytic anemia (AIHA). This is the most common hemolytic anemia condition (AIHA accounts for half of all cases of hemolytic anemia). For some unknown reason, AIHIA causes your body's own immune system to make antibodies that attack your own healthy red blood cells. AIHIA may become serious and come on very quickly. Alloimmune hemolytic anemia (AHA). AHA occurs when the immune system attacks transplanted tissue, a blood transfusion, or in some pregnant women, the fetus. 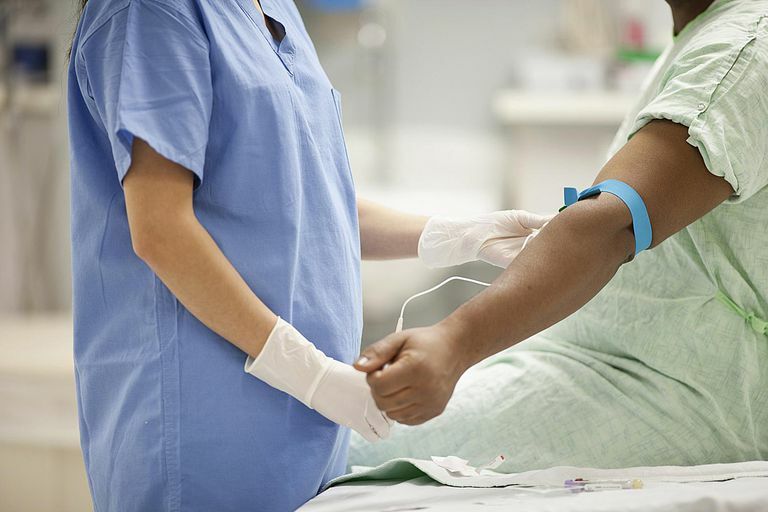 Since AHA can happen if the transfused blood is a different blood type than your blood, AHA can also happen during pregnancy when a woman has Rh-negative blood and her baby has Rh-positive blood. Rh factor is a protein in red blood cells and "Rh-negative" and "Rh-positive" refers to whether your blood has Rh factor. Drug-induced hemolytic anemia. When a medicine triggers your body's immune system to attack its own red blood cells, you may be a drug-induced hemolytic anemic. Chemicals in medicines (such as penicillin) can attach to red blood cell surfaces and cause the development of antibodies. Other Causes of Damage to Red Blood Cells. Certain infections, chemicals, and substances can also damage red blood cells, leading to hemolytic anemia. Some examples include toxic chemicals, malaria, tick-borne diseases or snake venom. Newborn screening programs as mandated by each State usually screens (using routine blood tests) for sickle cell anemia and G6PD deficiency in babies. Early diagnosis of these inherited conditions is vital so that children can get proper treatment. National Institutes of Health. Types of Hemolytic Anemia. www.nhlbi.nih.gov.